This summer, the YMCA of Austin is proud to serve as a Community Collaborator for the 2018 Mandela Washington Fellowship program for Young African Leaders. For the fifth consecutive year, the University of Texas at Austin is hosting 25 of Africa’s bright, emerging Business and Entrepreneurship leaders for a six-week Academic and Leadership Institute, sponsored by the U.S. Department of State. 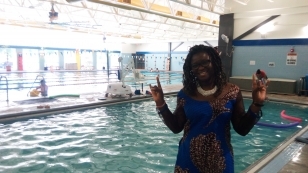 The TownLake branch of the YMCA of Austin is hosting one of those fabulous 25, Faizah Sabi of Togo, who is working with Erin Walter, Community Engagement Director, to learn about the Y's programs, funding, administration, and more. Faizah has already made a positive impact on the branch with her presence, Rev. Walter said. Faizah has shared inspiring stories and photos of her women's exercise classes in Togo, which bridge religious and cultural barriers in the interest of community and wellness. "We could not be more thrilled to have Faizah as part of our TownLake team this summer," Rev. Walter said. "Her enthusiasm for our Y mission and her passion and talent for community health programs have been shining through after even her first afternoon at the branch. I know we will learn from Faizah just as she learns from us." Caption: Faizah Sabi (making a hook 'em horns) and Community Engagement Director Erin Walter are excited to be working together this month. About Faizah: "Faïzah Sabi is the founder and director of the Medico-Sport Center Ibas (CMSI), where she works with patients and professional sports clients. Faïzah also volunteers at the National Center for Physiotherapy and Orthopedics in Togo. She has a blog on which she provides advice about her career, common diseases she encounters on the job, good nutrition, and physical activities. She holds a Bachelor’s degree in Sports Physiotherapy from the Moroccan School of Applied Paramedical Sciences (ESPA). Faïzah is committed to creating healthier lifestyles in her community. She provides nutritional education to women because she believes that an educated woman means a healthier family." About the Mandela Washington Fellowship: The fellowship is the flagship program of the Young African Leaders Initiative (YALI), empowering young African leaders through academic coursework, leadership training, mentoring, networking, professional opportunities, and local community engagement. Since 2014, the U.S. Department of State has brought 3,000 young leaders from across Sub-Saharan Africa to the United States to develop their leadership skills and foster connections and collaborations with U.S. professionals. Infographic courtesy of Mandela Washington Fellowship and UT International Office. Stay tuned to the YMCA blog for an upcoming post from Faizah about her experience at TownLake. And please help us welcome her when you see her around the branch! Last but not least, participation in this fellowship program is far from the only way that the YMCA is international and multicultural. Did you know the World YMCA is in more than 12,000 communities around the globe? If you're part of the Y, you can be proud to be part of a global movement. Learn more about the World Y here.